This domain is found in eukaryotes, and is approximately 40 amino acids in length. It is found associated with F-box domain, WD domain. The protein that contains this domain functions as a ubiquitin ligase. Ubiquitination is required to direct proteins towards the proteasome for degradation. 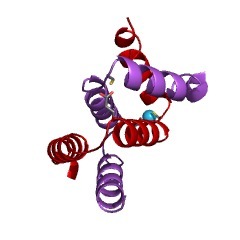 This protein is part of the WD40 class of F box proteins. The D domain of these F box proteins is involved in mediating the dimerisation of the protein. Dimerisation is necessary to polyubiquitinate substrates so this D domain is vital in directing substrates towards the proteasome for degradation. This entry represents the D domain of beta-TrCP, which is a member of the WD40 class of F box proteins, and functions as a ubiquitin ligase. The D domain of these F box proteins is involved in mediating dimerisation of the protein [(PUBMED:17574027)]. Dimerisation is necessary to polyubiquitinate substrates, so this D domain is vital in directing substrates towards the proteasome for degradation. There are 941 Beta-TrCP_D domains in 938 proteins in SMART's nrdb database. Taxonomic distribution of proteins containing Beta-TrCP_D domain. This tree includes only several representative species. The complete taxonomic breakdown of all proteins with Beta-TrCP_D domain is also avaliable. Click on the protein counts, or double click on taxonomic names to display all proteins containing Beta-TrCP_D domain in the selected taxonomic class.